If you’re into the old slasher flicks of the 80s this is the book for you! 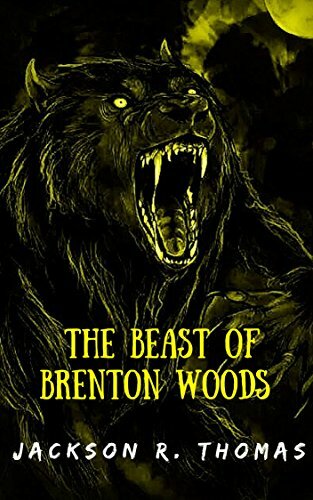 The Beast of Brenton Woods by Jackson R Thomas is a fast-paced gory take on the werewolf genre. With simultaneous storylines that pull together for an explosive ending, we read of the legendary creature who has been stalking the residents of Brenton Woods. People have been talking about the great white werewolf for years, but no one can say they have ever seen it, or… maybe some have and just don’t want to talk about it. All of that is about to change! Ben and Tyler, a couple of young teens were getting ready to camp out in the backyard when the beast first made himself known to the boys. For some reason Ben finds himself drawn to the monster in the woods. Johnny along with his sister Wendy and friend Bryan are young adults with not much going on in their lives. Not much excitement to be found in such a little town but they do have the old cabin out in the woods as their private hangout. Only… it won’t be their sanctuary for much longer. The beast is stirring. Now old Sherriff Decker has been around for a long time. He knows what’s up, but he has his own agenda and that doesn’t include letting the townsfolk or even his own deputies believing in werewolves. With all these characters the action is plenty! This book will keep you guessing… who’s going to die next? Who is going to survive the mayhem? Does anyone truly escape? It’s been a while since I’ve read a good old school horror story, I enjoyed it and I think you will too! You can pick up your copy HERE!